Please use the form below if you wish to contact the Community Council about any issue. Once we have received your enquiry it will be dealt with as soon as possible. 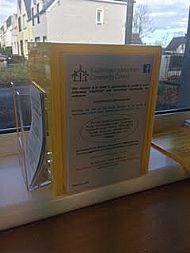 The Community Council now have a suggestion box in Eaglesham Library. Please feel free to use this box to give any suggestions for issues you would like us to look at or for feedback. Please also pass this on to any members of the community who are not online or on facebook. In the meantime you can find out more information about us and our work throughout this site or on the East Renfrewshire Council website which can be found here.